The captain of the doomed Germanwings plane shouted at his co-pilot, Andreas Lubitz, “Open the damn door!” as he desperately tried to return to the cockpit. The harrowing plea has been revealed by the black box recording of the flight’s last minutes. "For God's sake, open the door," the captain,Patrick Sondheimer, shouted at a silent Lubitz, who appears to have locked the captain out of the cockpit before the plane crashed in the French Alps. A transcript from the cockpit recorder waspublishedin the German newspaper Bild on Sunday. The passengers’ screams could also be heard in the moments before the crash. All 150 people aboard were killed. Sondenheimer was also heard trying to smash the door with what sounds like an ax, and yelling at his co-pilot, "Open the damn door!" The transcript also reveals that the captain decided to leave the cockpit as he had not had time to go to the toilet in Barcelona. Lubitz reportedly suffered from vision problems caused by a detached retina, wrote Bild. However, the investigation is unsure if his vision problems were caused by physical or psychological factors. Maria W., a 26-year-old cabin crew employee whose full name has not been released to the press, described Lubitz as "tormented" and secretive. She recalled that when she heard about the crash, she remembered how Lubitz had said he would do something one day "that would change the system" so "everyone will then know my name and remember me." "I did not know what he meant by that at the time, but now it's clear," Maria said, adding that Lubitz, 27, sometimes woke up at night screaming, "We're going down!" in terror. 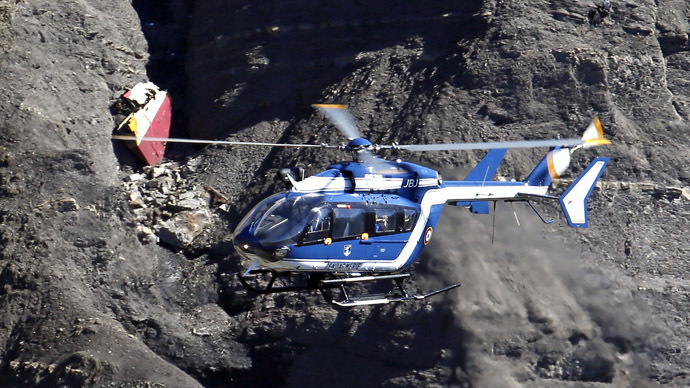 On Friday, prosecutors in Düsseldorf said that police discovered in Lubitz's home a torn sick note covering the date of the crashed Germanwings flight. They believe he could have been concealing his medical condition from the airline. Bild also reported Friday that Lubitz had spent 18 months undergoing psychiatric treatment. Lubitz allegedly sought psychiatric help for "a bout of serious depression" in 2009 and was still getting assistance from doctors. The newspaper also claimed it had gained access to Lubitz’s profile, indicating the pilot had “psychological problems” and required a "special, exemplary regular medical examination." a pity that the news outlets focus on the co-pilot. The person who should be remembered is actually Captain Patrick Sondenheimer. Some of Lubitz’s colleagues have described his behaviour as ”normal,” and said he didn’t seem to be suicidal. "I got to know him...as a very nice, fun and polite young man," Klaus Radke, head of the local flight club in the town of Montabaur in western Germany, said. He added that Lubitz came across as "a completely normal guy." Lubitz “was a lot of fun, even though he was perhaps sometimes a bit quiet,” Radke said. “He was just another boy like so many others here." German Interior Minister Thomas de Maiziere has said that Lubitz had no known association with terrorist groups, adding: "We checked everything." Sounds on the recovered voice recorder suggest that Lubitz was alive and breathing until the moment of impact. The unprecedented tragedy has shocked the aviation world. Several airlines have already responded by changing their rules to require a second crew member to be in the cockpit at all times, a rule that is already in effect in the US, but not in Europe.